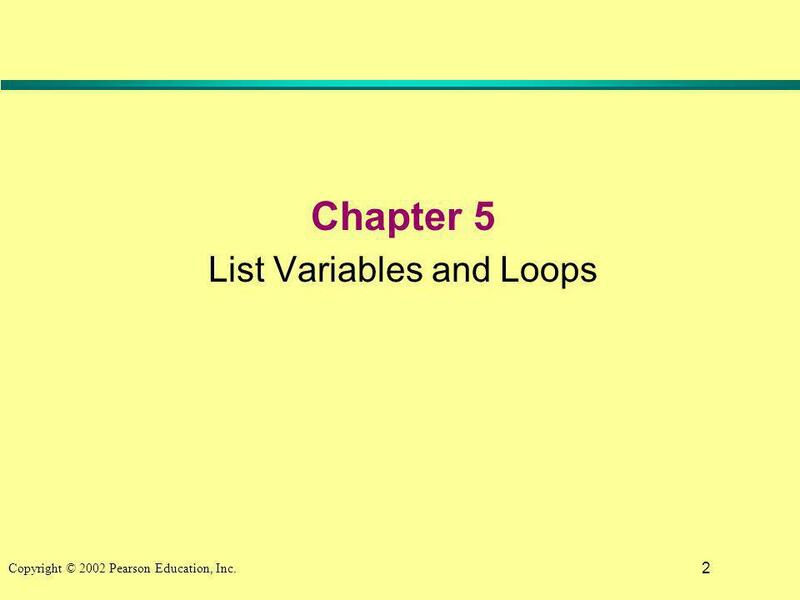 1 Copyright © 2002 Pearson Education, Inc.. 2 Chapter 5 List Variables and Loops. 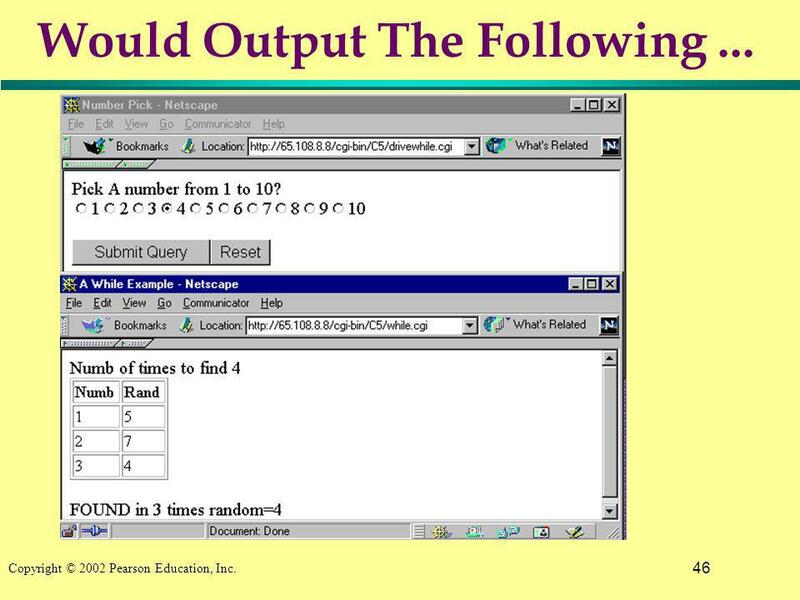 4 4 Copyright © 2002 Pearson Education, Inc. 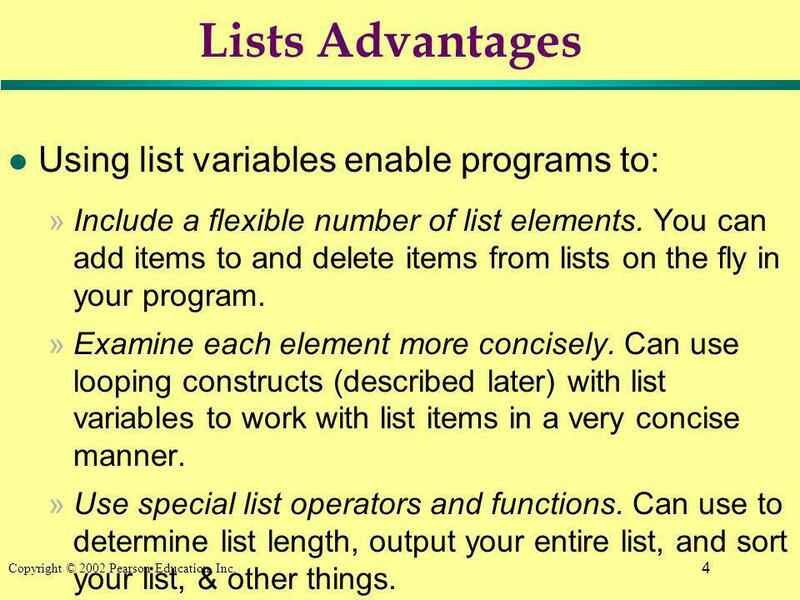 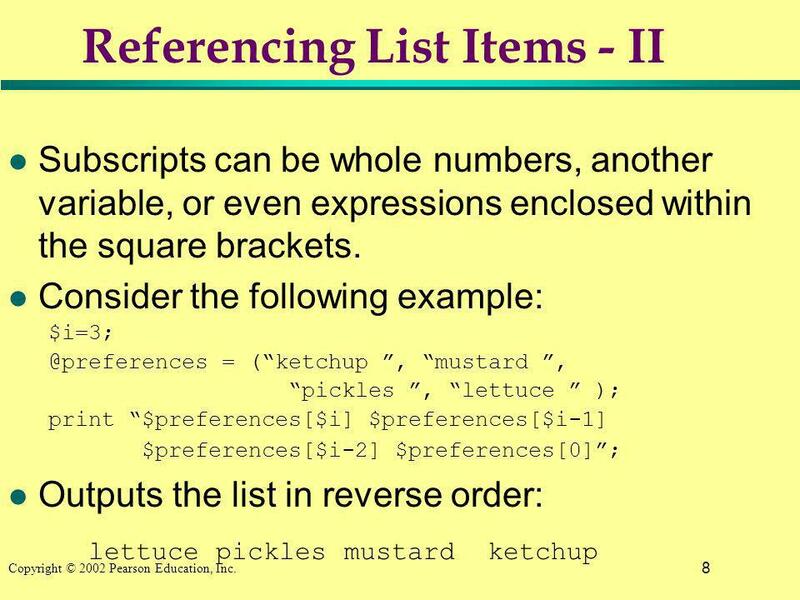 Lists Advantages l Using list variables enable programs to: »Include a flexible number of list elements. 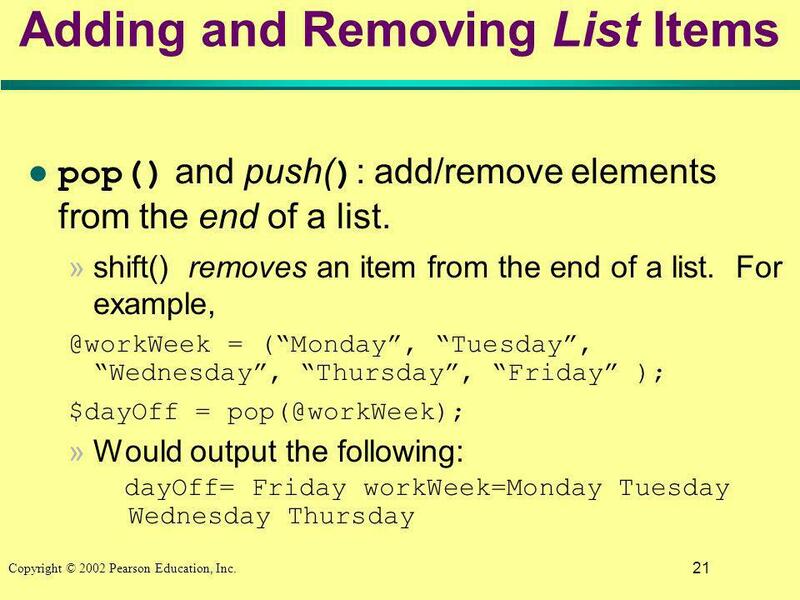 You can add items to and delete items from lists on the fly in your program. 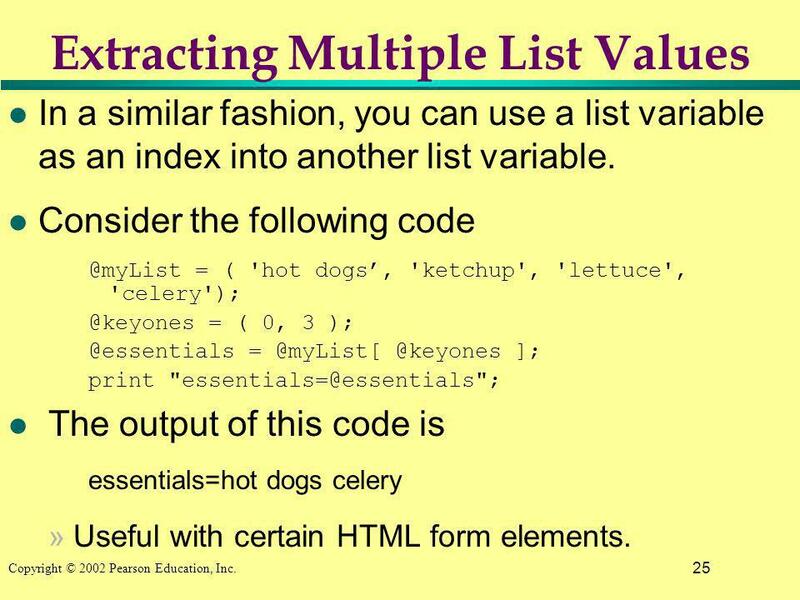 »Examine each element more concisely. 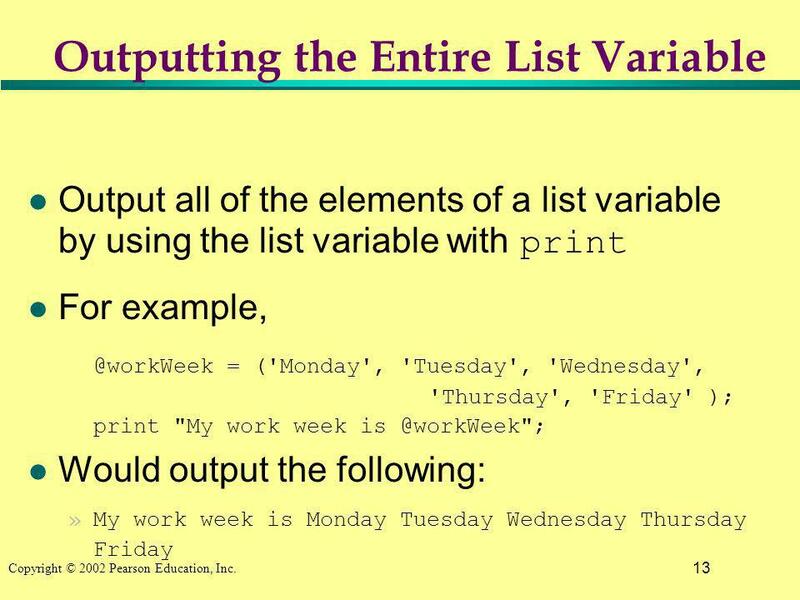 Can use looping constructs (described later) with list variables to work with list items in a very concise manner. 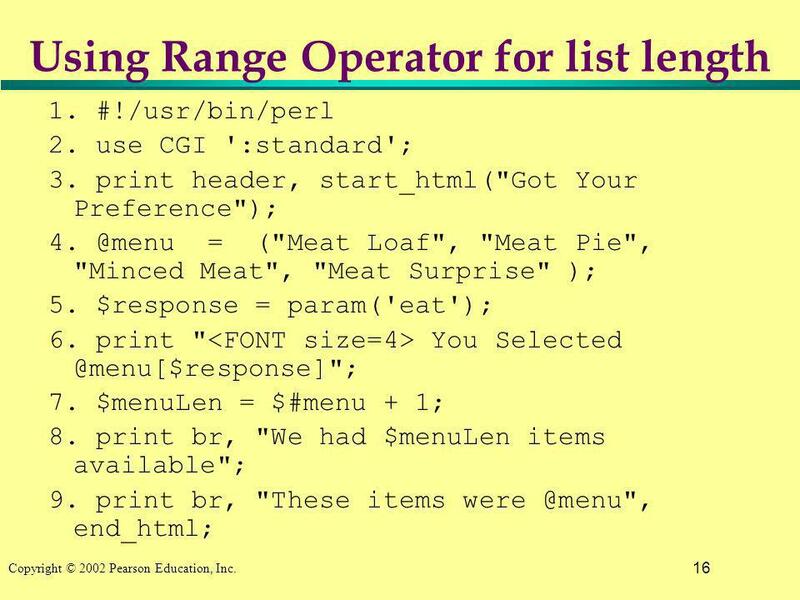 »Use special list operators and functions. 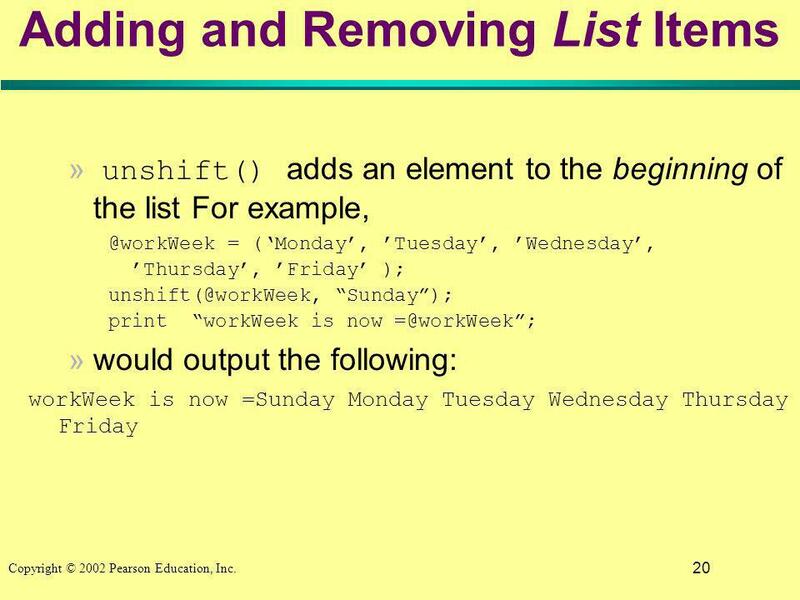 Can use to determine list length, output your entire list, and sort your list, & other things. 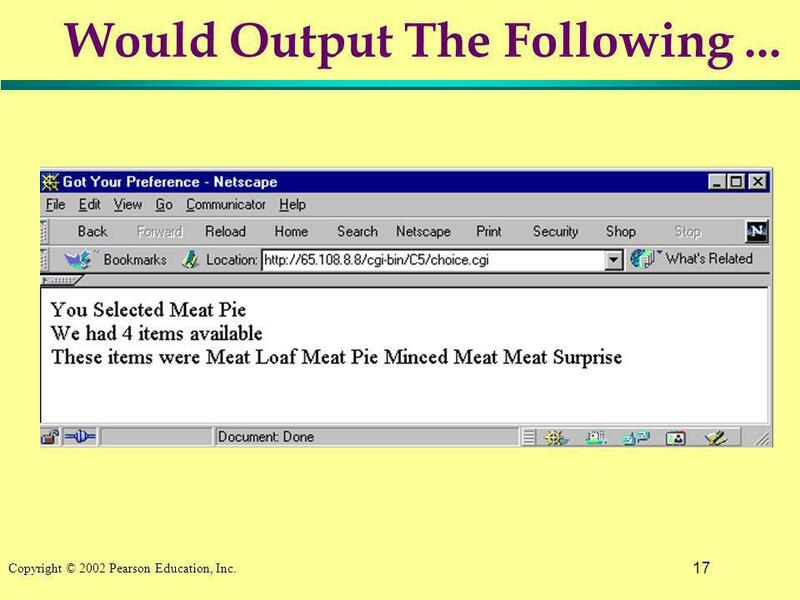 6 6 Copyright © 2002 Pearson Education, Inc. 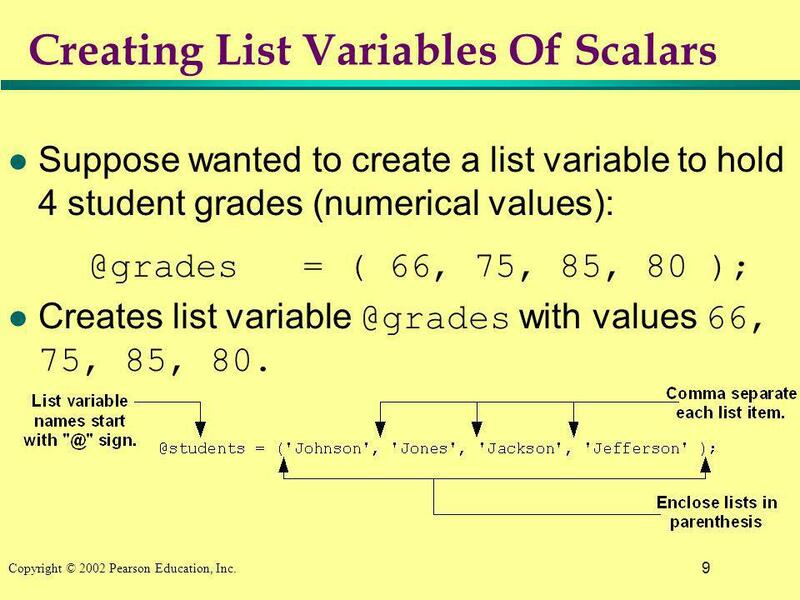 Creating List Variables Of Scalars l Suppose wanted to create a list variable to hold 4 student grades (numerical values): @grades = ( 66, 75, 85, 80 ); Creates list variable @grades with values 66, 75, 85, 80. 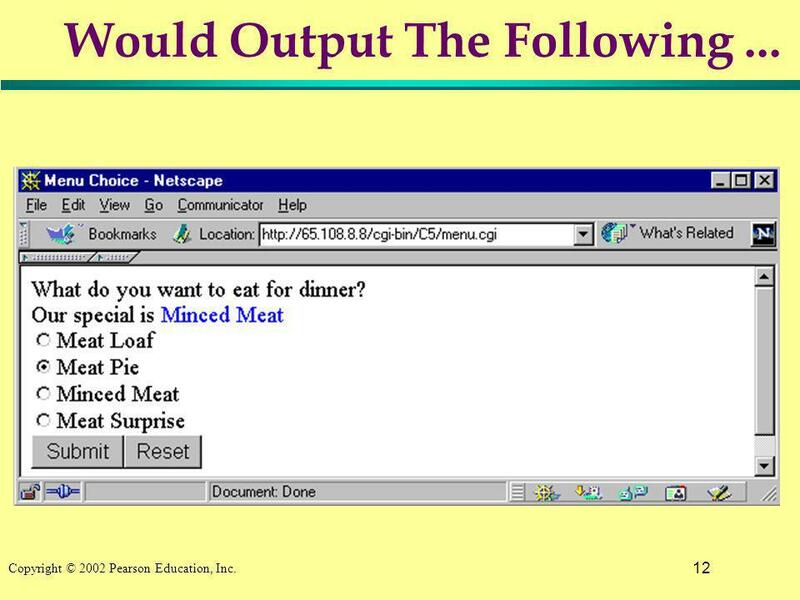 9 9 Copyright © 2002 Pearson Education, Inc. 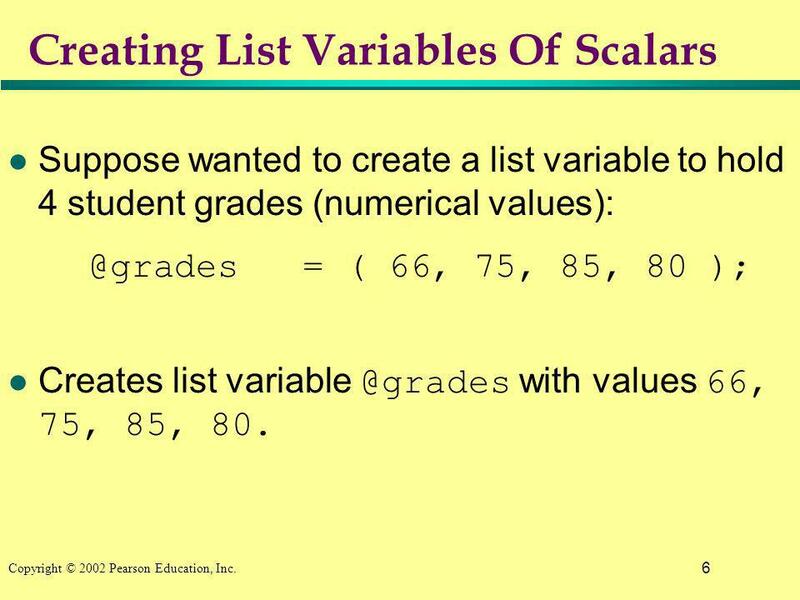 Creating List Variables Of Scalars l Suppose wanted to create a list variable to hold 4 student grades (numerical values): @grades = ( 66, 75, 85, 80 ); Creates list variable @grades with values 66, 75, 85, 80. 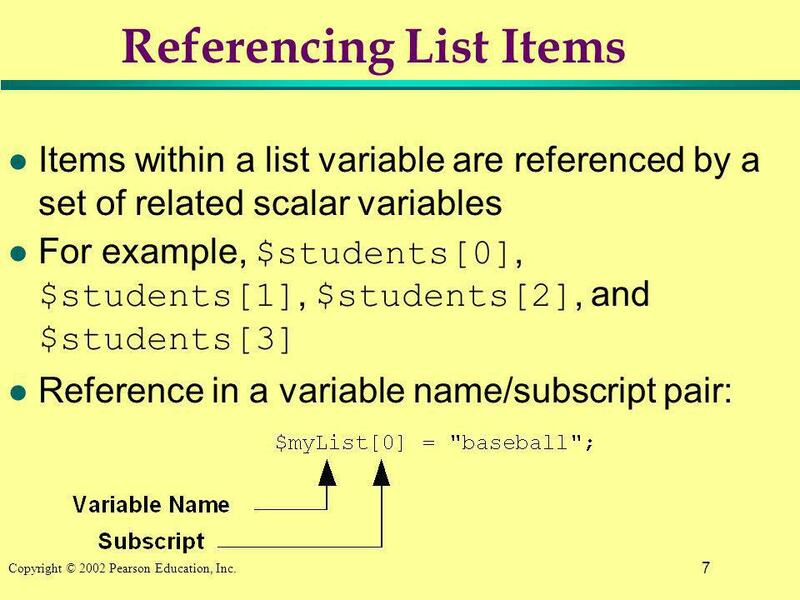 10 10 Copyright © 2002 Pearson Education, Inc. Changing Items In A List Variable l Change values in a list variable and use them in expressions like other scalar variables. 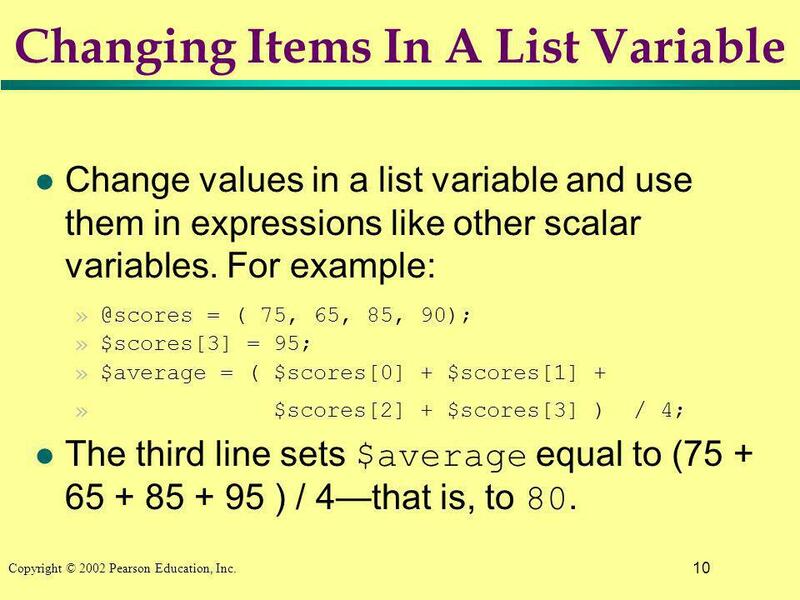 For example: »@scores = ( 75, 65, 85, 90); »$scores = 95; »$average = ( $scores + $scores + » $scores + $scores ) / 4; The third line sets $average equal to (75 + 65 + 85 + 95 ) / 4that is, to 80. 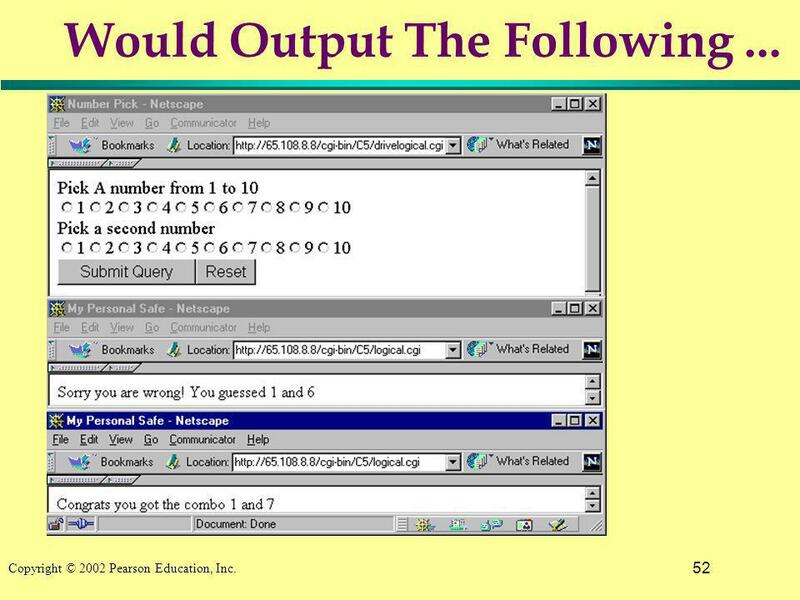 15 15 Copyright © 2002 Pearson Education, Inc. 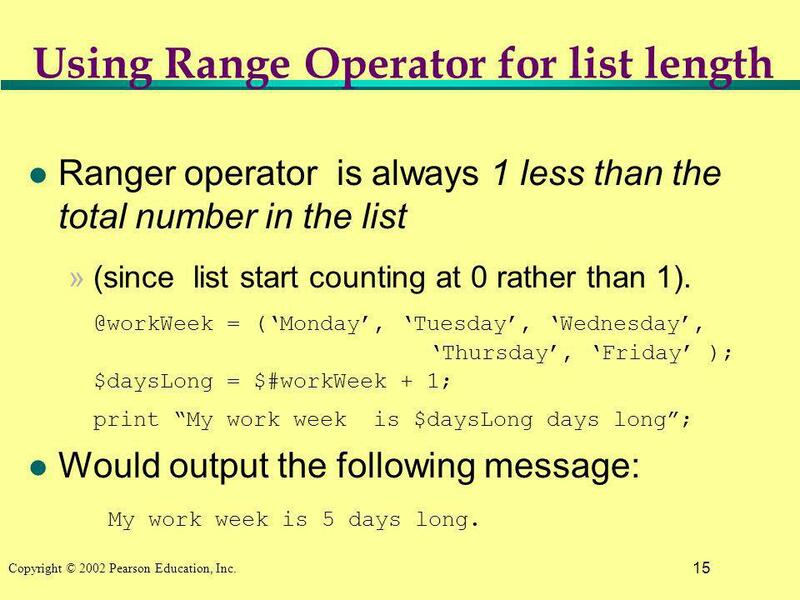 Using Range Operator for list length l Ranger operator is always 1 less than the total number in the list »(since list start counting at 0 rather than 1). 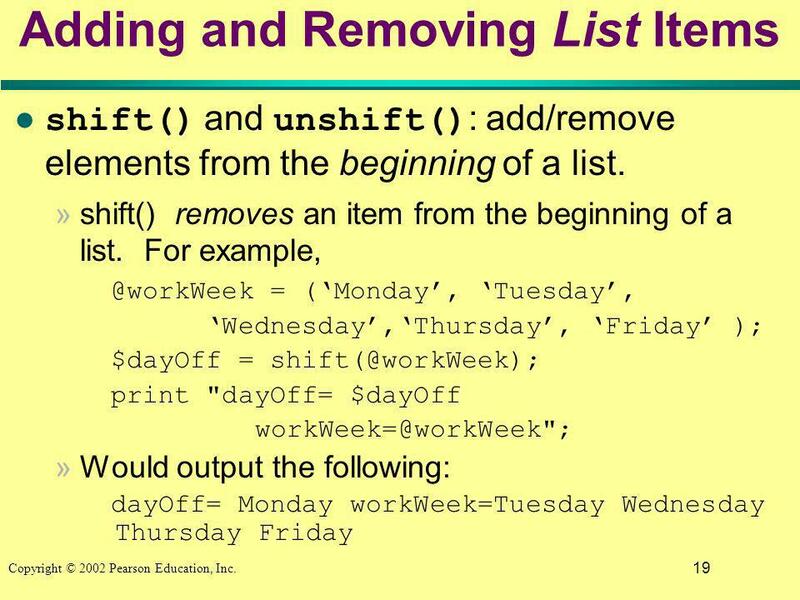 @workWeek = (Monday, Tuesday, Wednesday, Thursday, Friday ); $daysLong = $#workWeek + 1; print My work week is $daysLong days long; l Would output the following message: My work week is 5 days long. 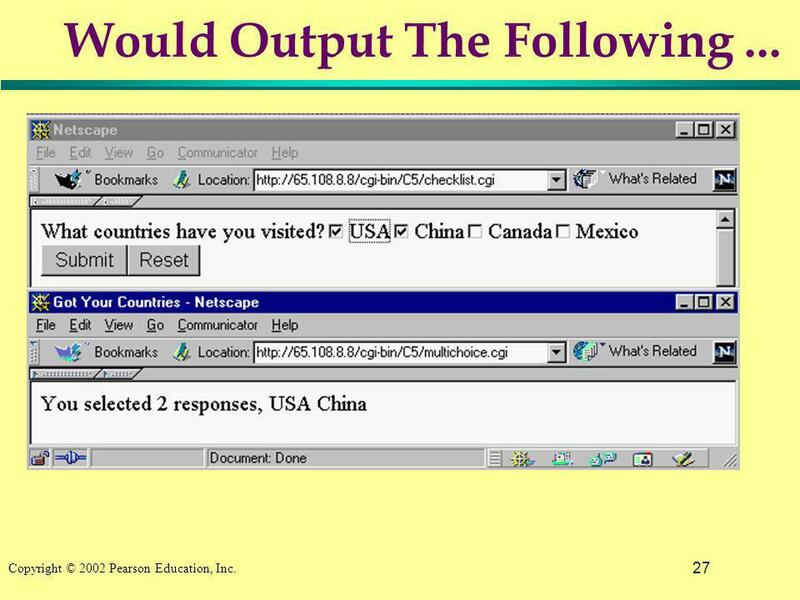 25 25 Copyright © 2002 Pearson Education, Inc. 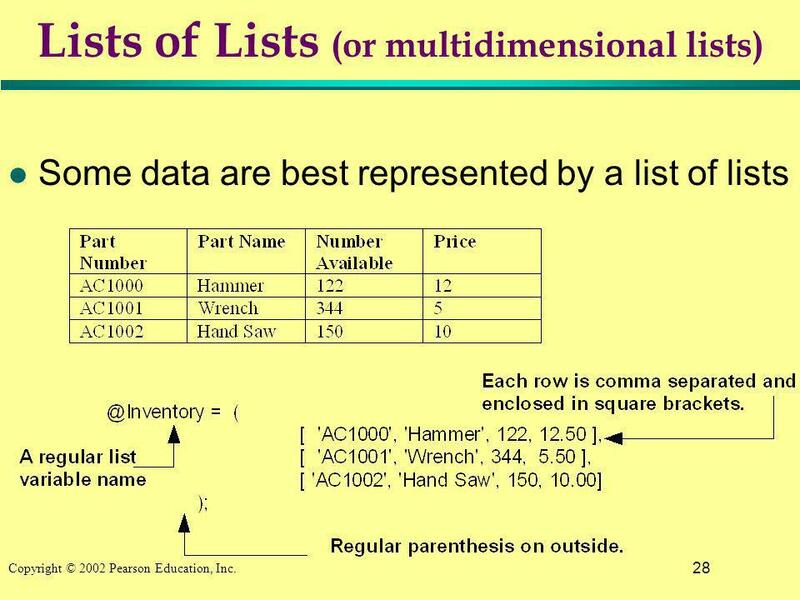 Extracting Multiple List Values l In a similar fashion, you can use a list variable as an index into another list variable. 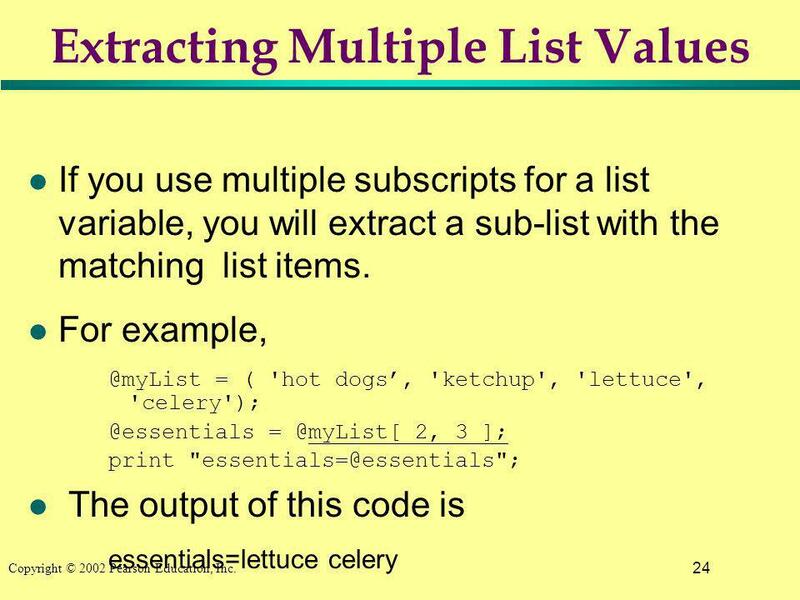 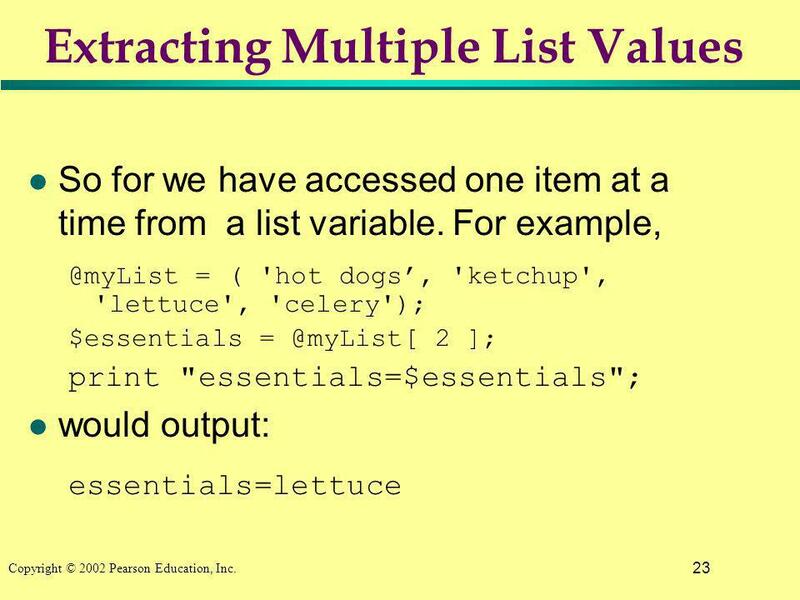 l Consider the following code @myList = ( 'hot dogs, 'ketchup', 'lettuce', 'celery'); @keyones = ( 0, 3 ); @essentials = @myList[ @keyones ]; print "essentials=@essentials"; l The output of this code is essentials=hot dogs celery »Useful with certain HTML form elements. 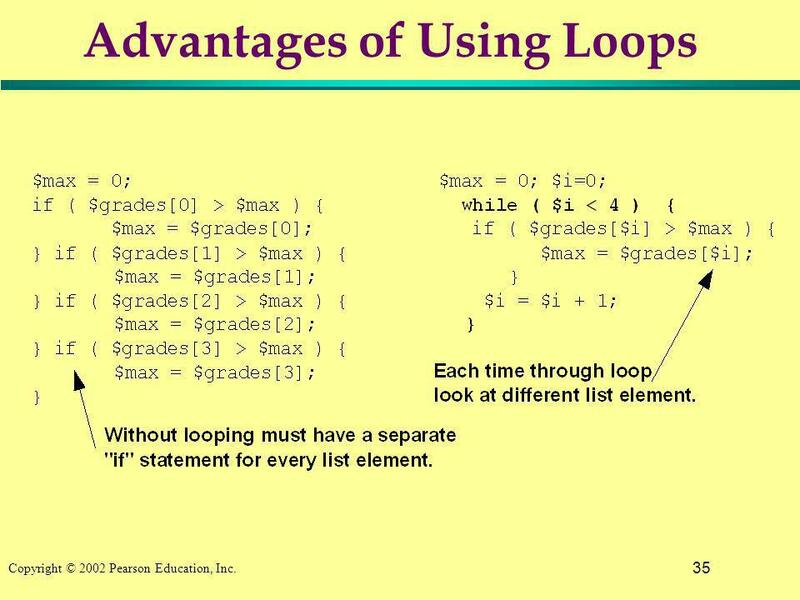 34 34 Copyright © 2002 Pearson Education, Inc. Looping Statements l Advantages of using loops: »Your programs can be much more concise. 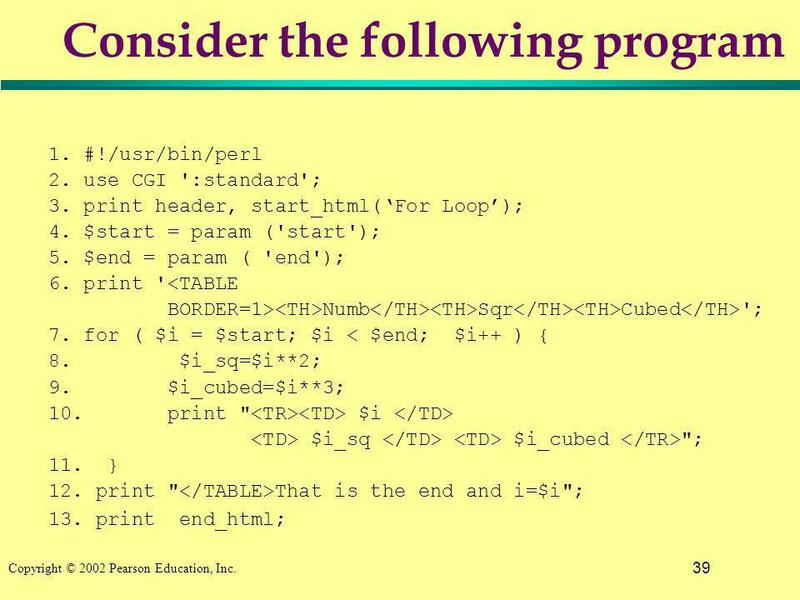 When similar sections of statements need to be repeated in your program, you can often put them into a loop and reduce the total number of lines of code required. 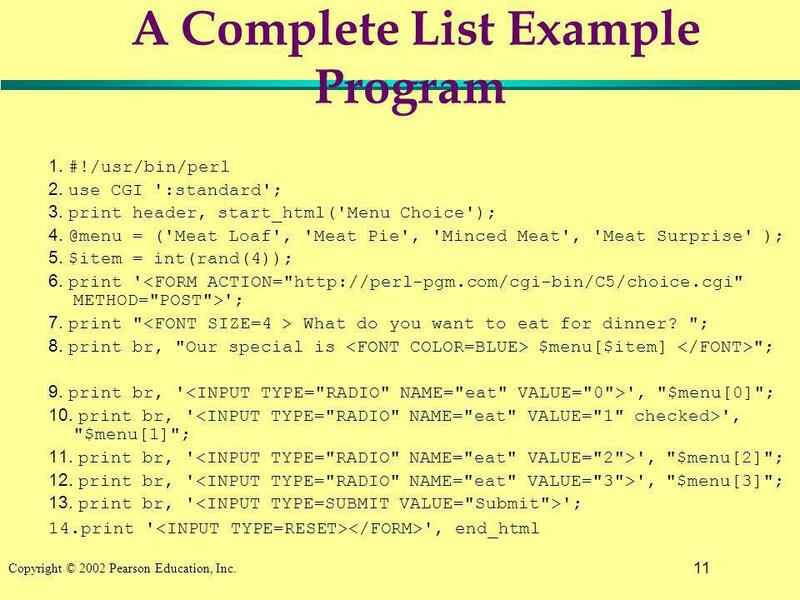 »You can write more flexible programs. 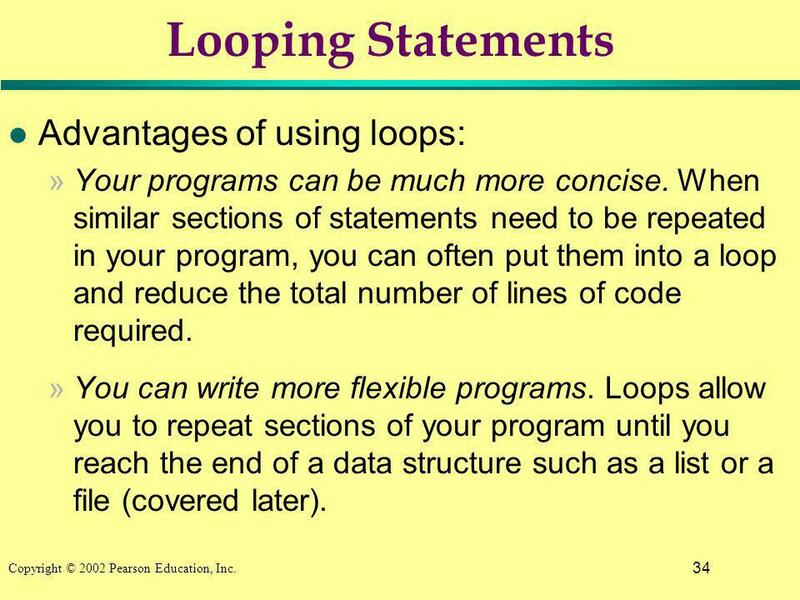 Loops allow you to repeat sections of your program until you reach the end of a data structure such as a list or a file (covered later). 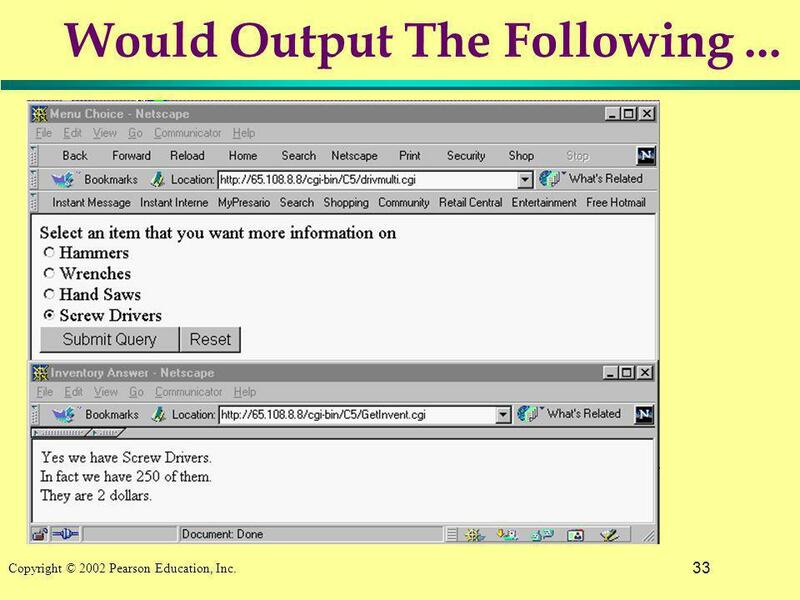 36 36 Copyright © 2002 Pearson Education, Inc. 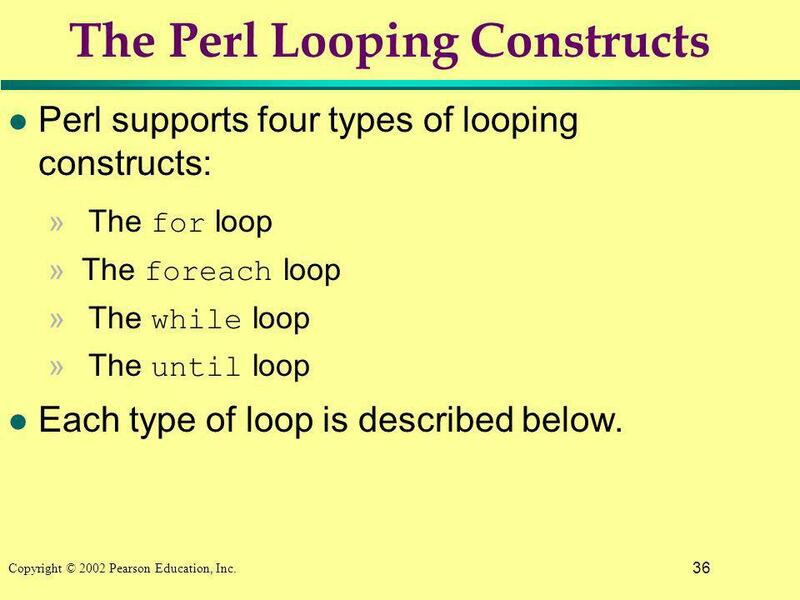 The Perl Looping Constructs l Perl supports four types of looping constructs: »The for loop » The foreach loop »The while loop »The until loop l Each type of loop is described below. 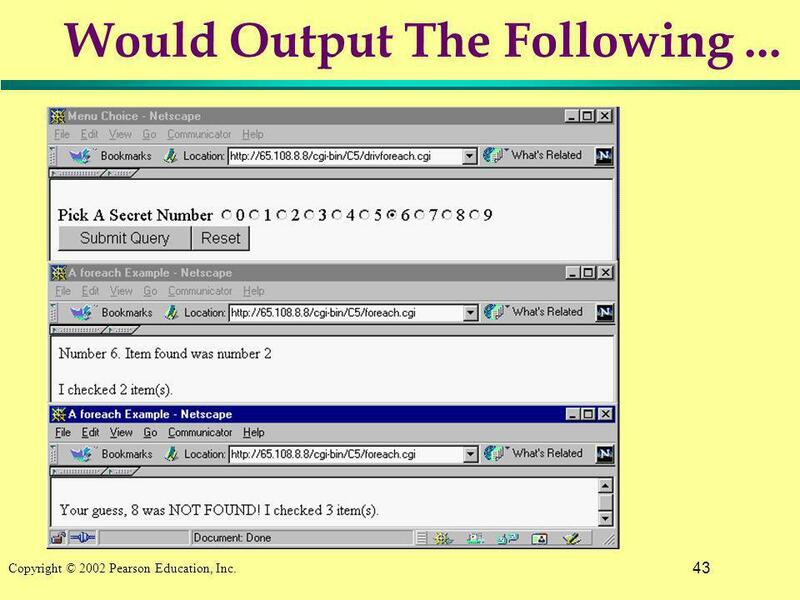 41 41 Copyright © 2002 Pearson Education, Inc. 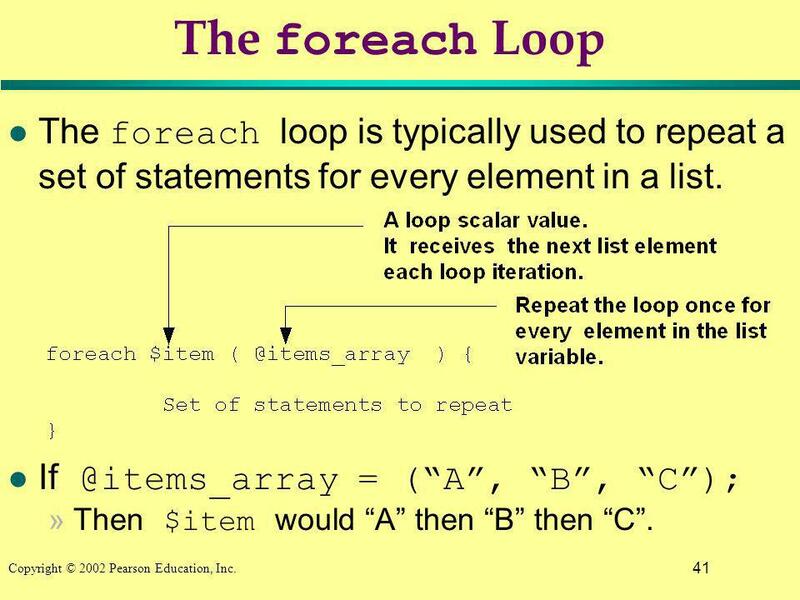 The foreach Loop The foreach loop is typically used to repeat a set of statements for every element in a list. 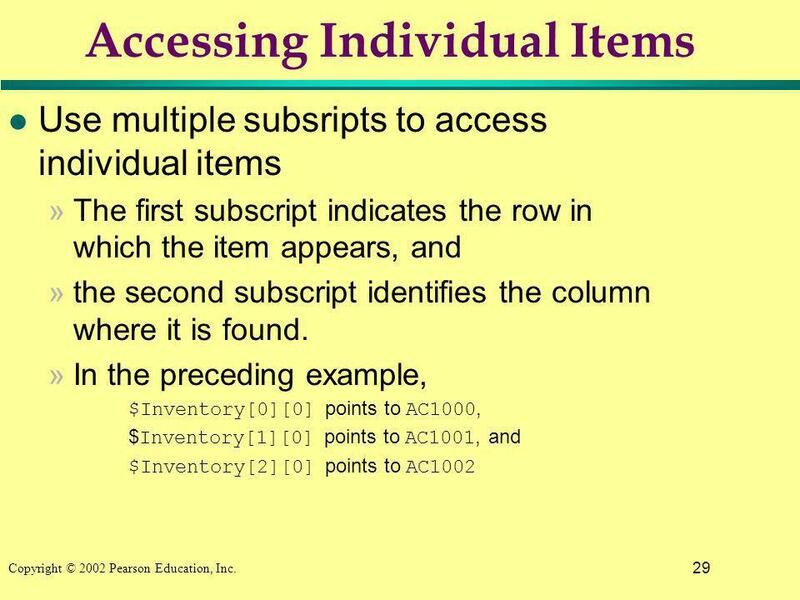 If @items_array = (A, B, C); »Then $item would A then B then C.
44 44 Copyright © 2002 Pearson Education, Inc. 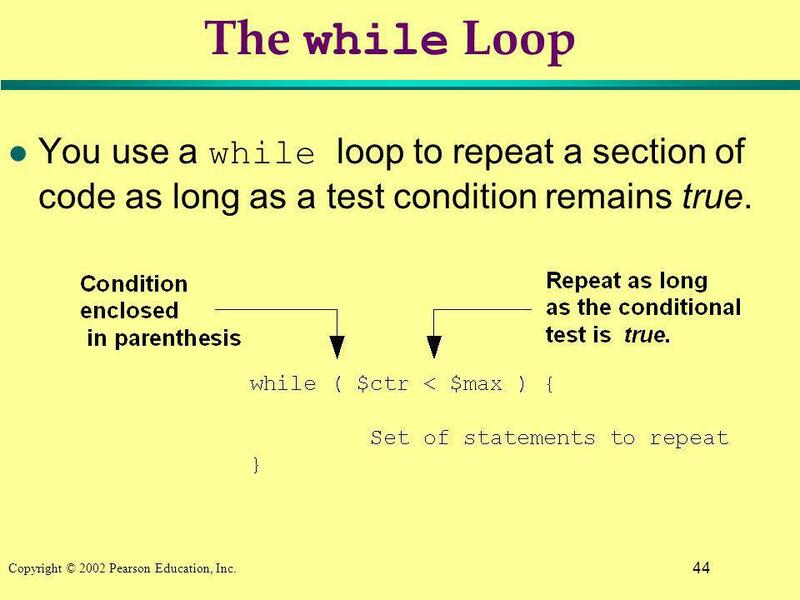 The while Loop You use a while loop to repeat a section of code as long as a test condition remains true. 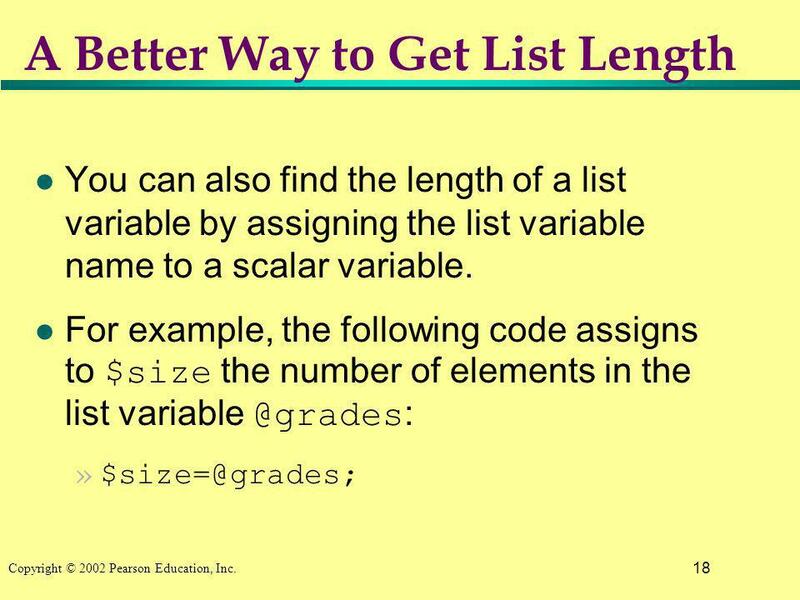 53 53 Copyright © 2002 Pearson Education, Inc. Summary l List variables offer a way to organize data in your program into one list instead of using individual scalar variables. 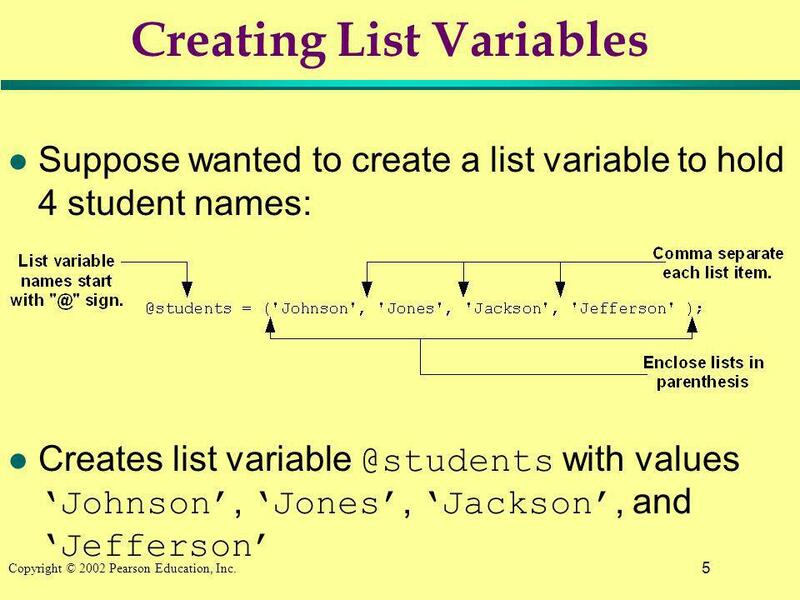 »Data elements within a list can be accessed by a common variable name, which is made up of two parts: a variable name and subscript values. 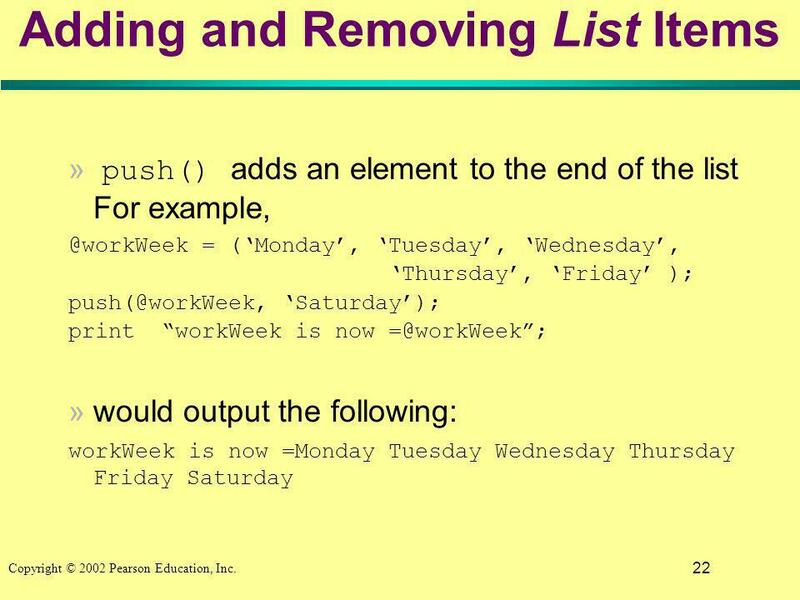 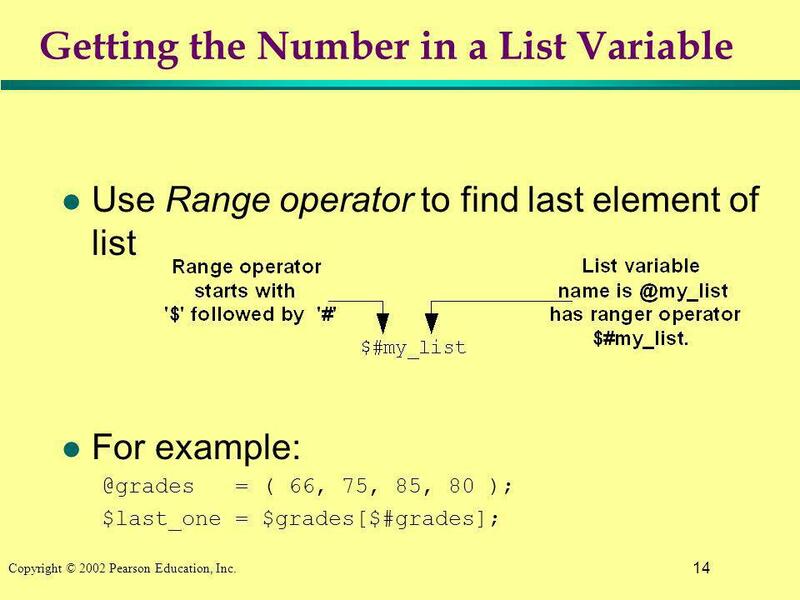 l Using list variables enables you to add and delete list items on the fly in your programs, use loop constructs to examine and operate on each item in your list, and utilize special list operators and functions. 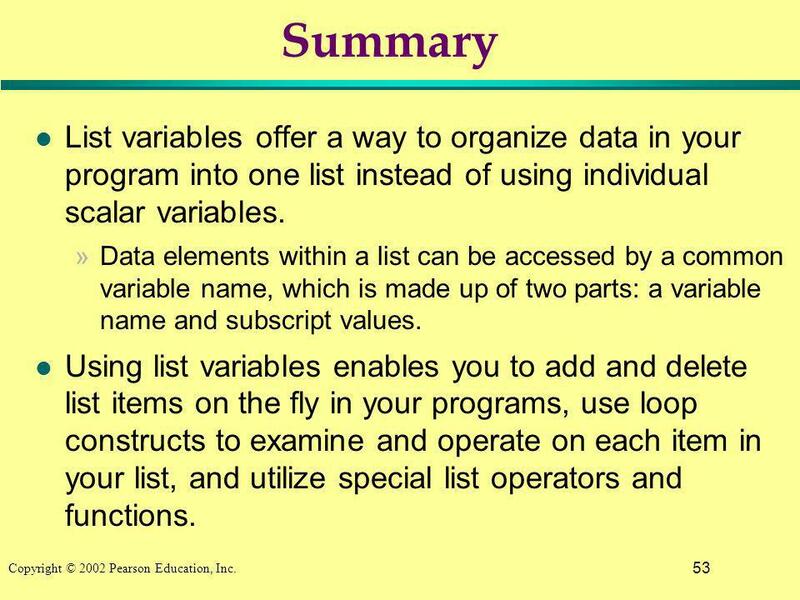 54 54 Copyright © 2002 Pearson Education, Inc. Summary Loops can be especially useful for examining and operating on data organized into lists. 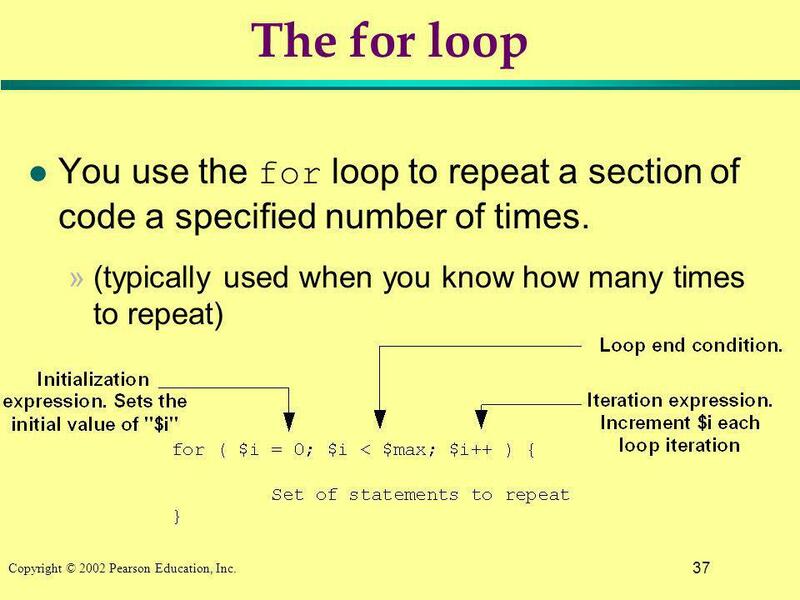 Loop statements include the for, foreach, while, and until loops. 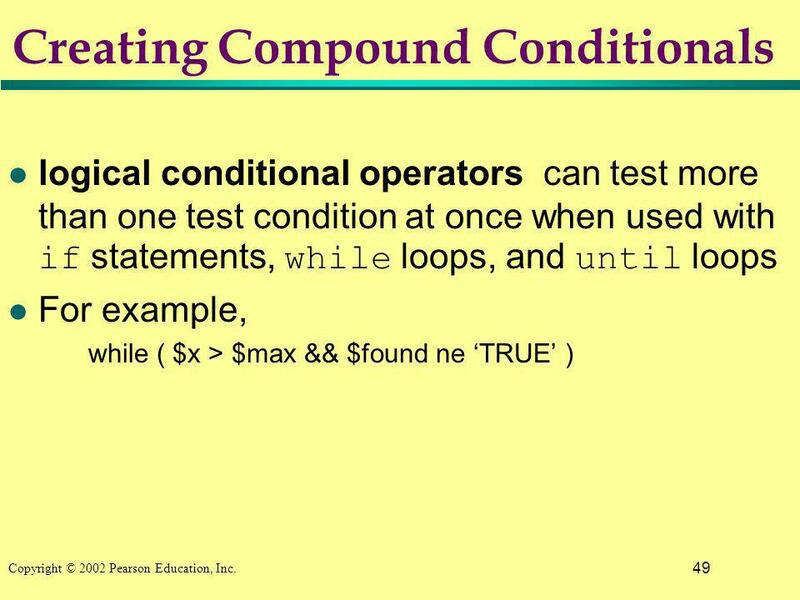 l The logical operators can be used to carry out compound tests within a conditional test statement. 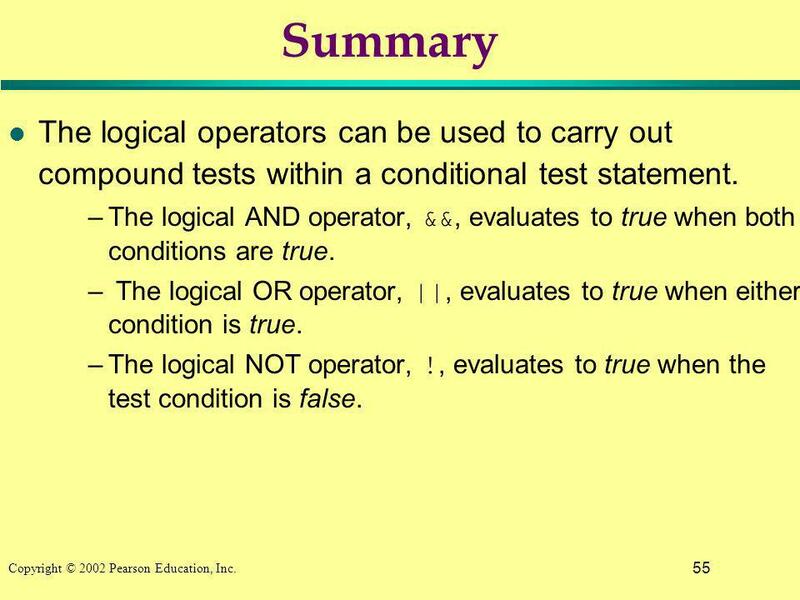 –The logical AND operator, &&, evaluates to true when both conditions are true. 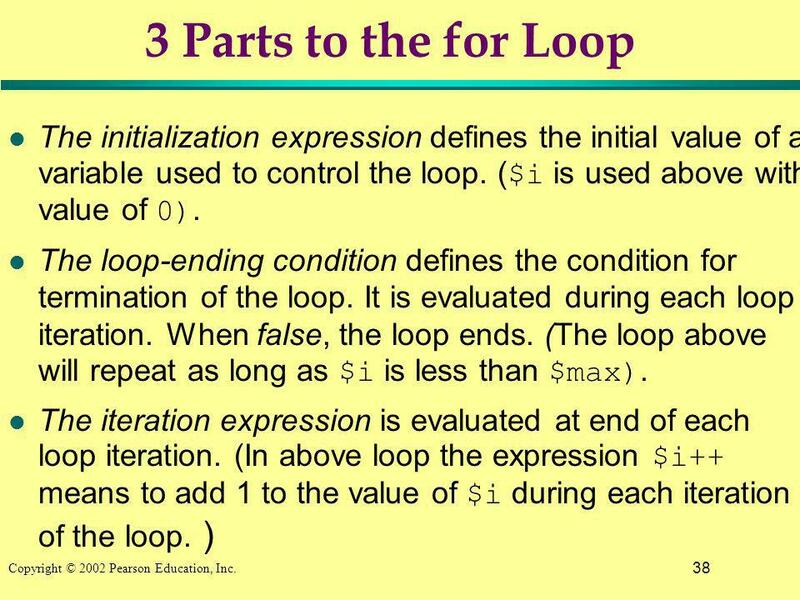 – The logical OR operator, ||, evaluates to true when either condition is true. 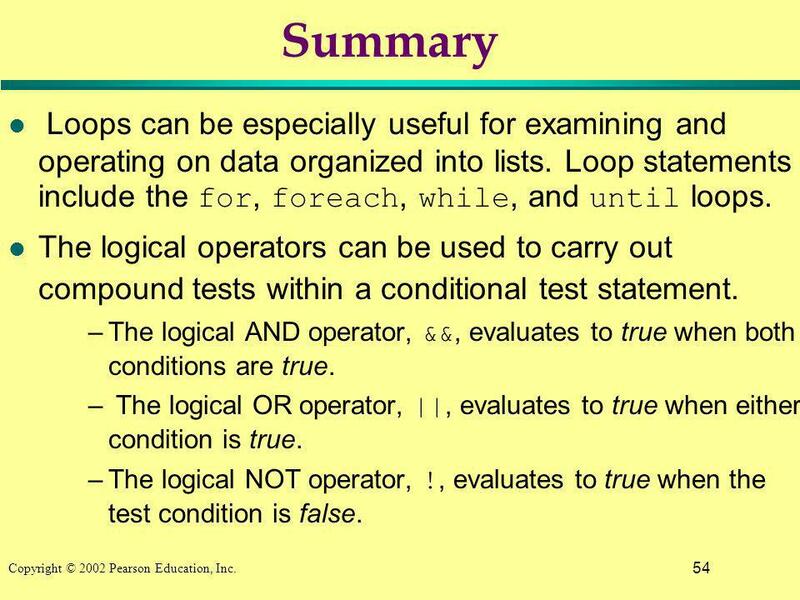 –The logical NOT operator, !, evaluates to true when the test condition is false. 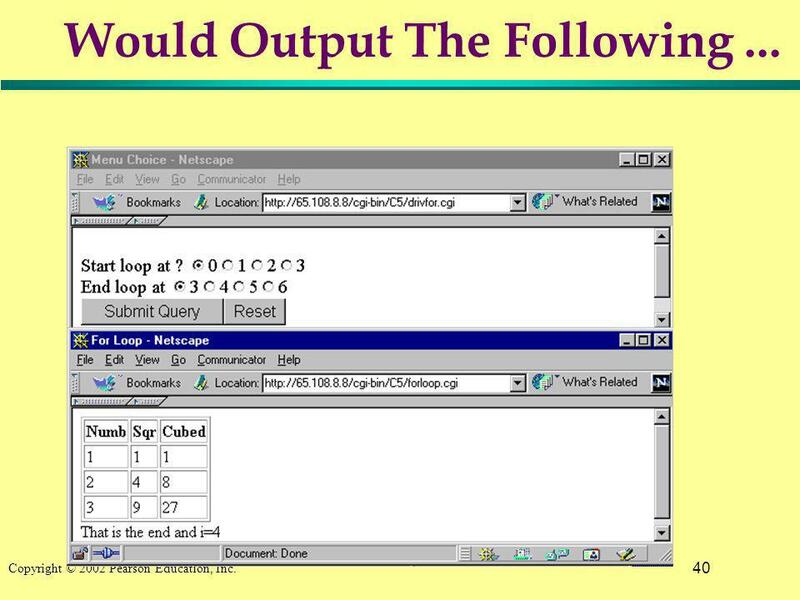 55 55 Copyright © 2002 Pearson Education, Inc. Summary l The logical operators can be used to carry out compound tests within a conditional test statement. 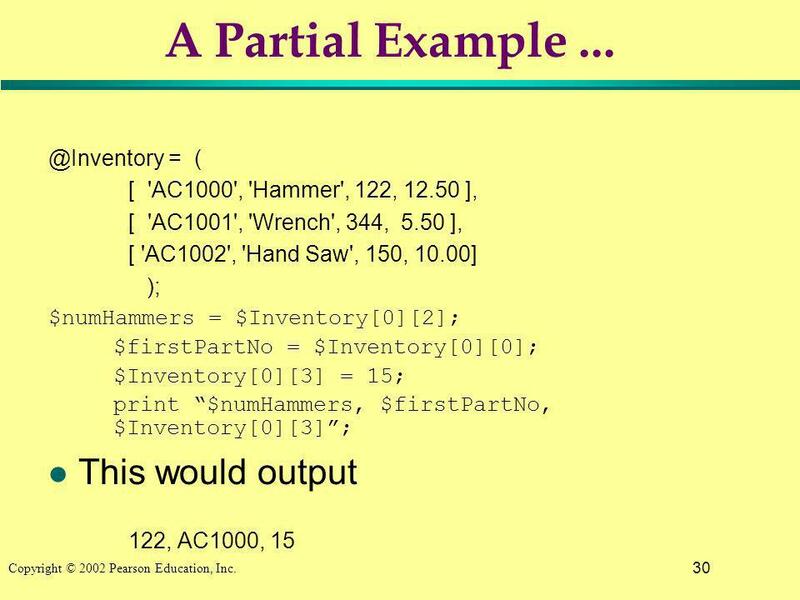 –The logical AND operator, &&, evaluates to true when both conditions are true. 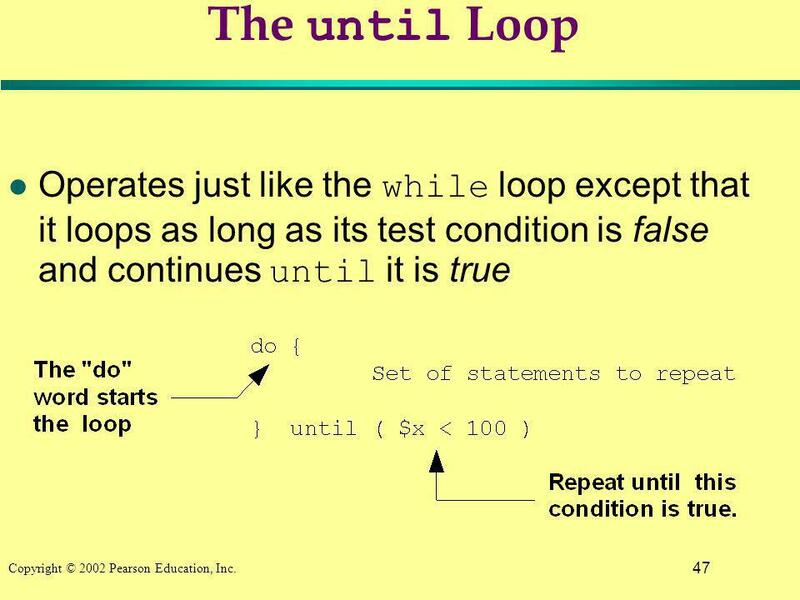 – The logical OR operator, ||, evaluates to true when either condition is true. 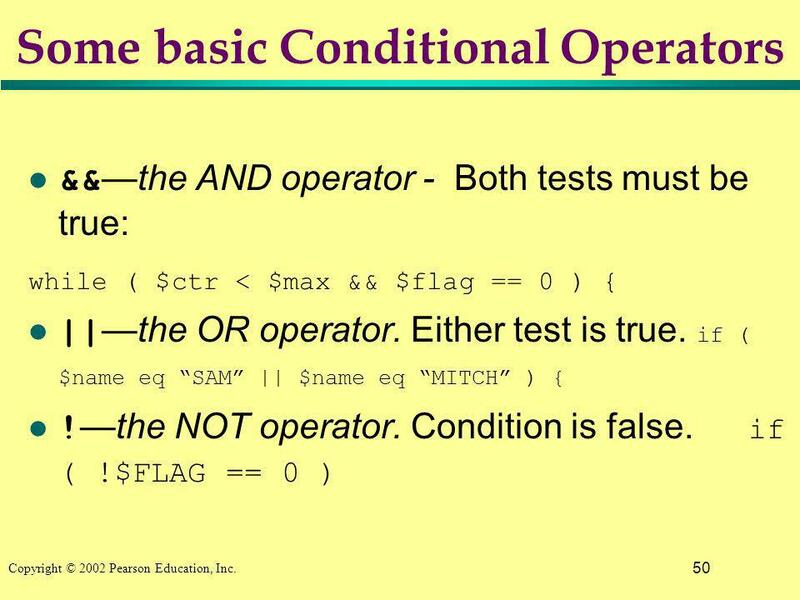 –The logical NOT operator, !, evaluates to true when the test condition is false. 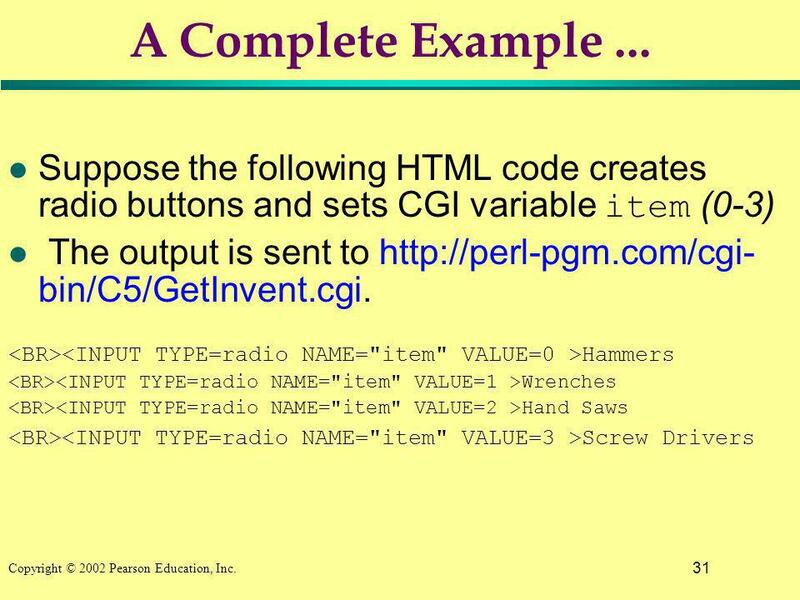 Download ppt "1 Copyright © 2002 Pearson Education, Inc.. 2 Chapter 5 List Variables and Loops." 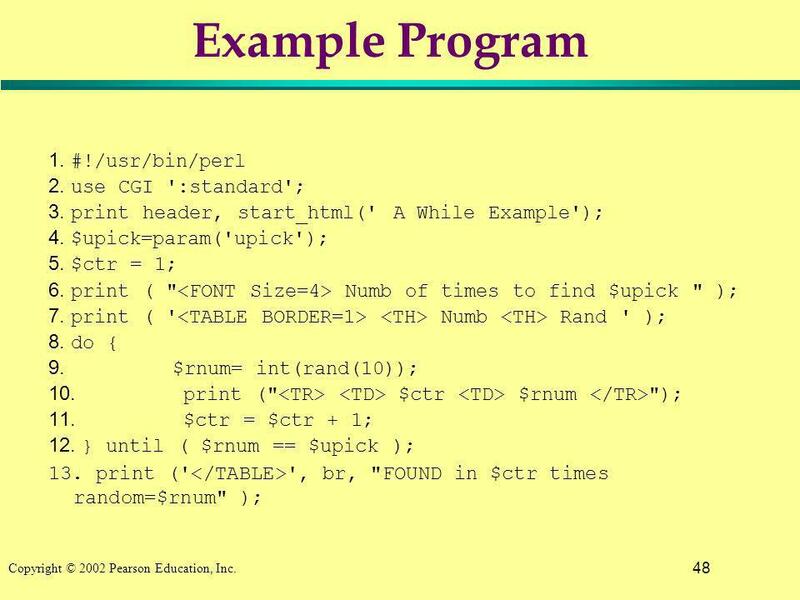 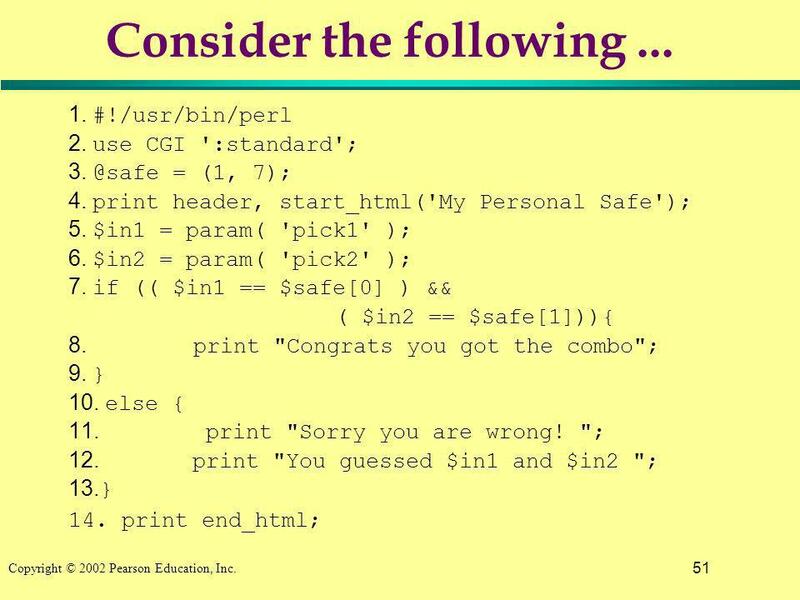 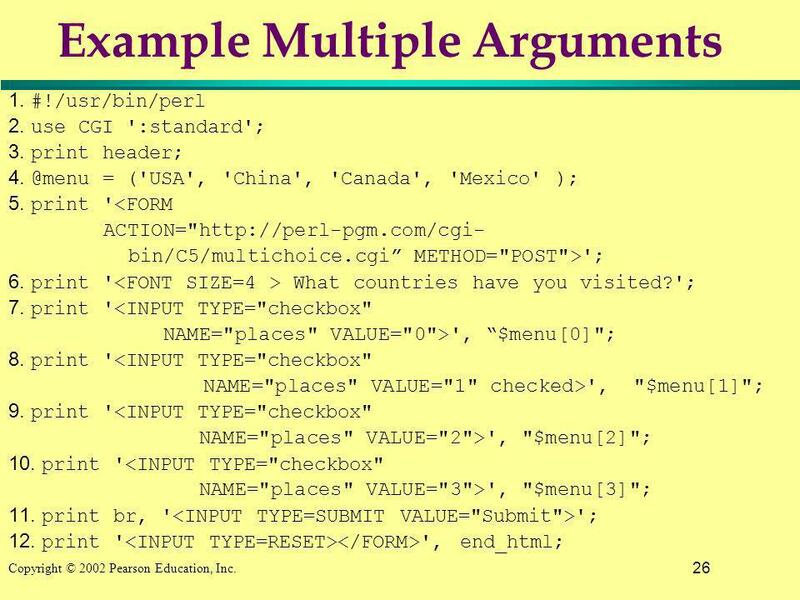 Copyright © 2003 Pearson Education, Inc. Slide 5-1 The Web Wizards Guide to PHP by David Lash. 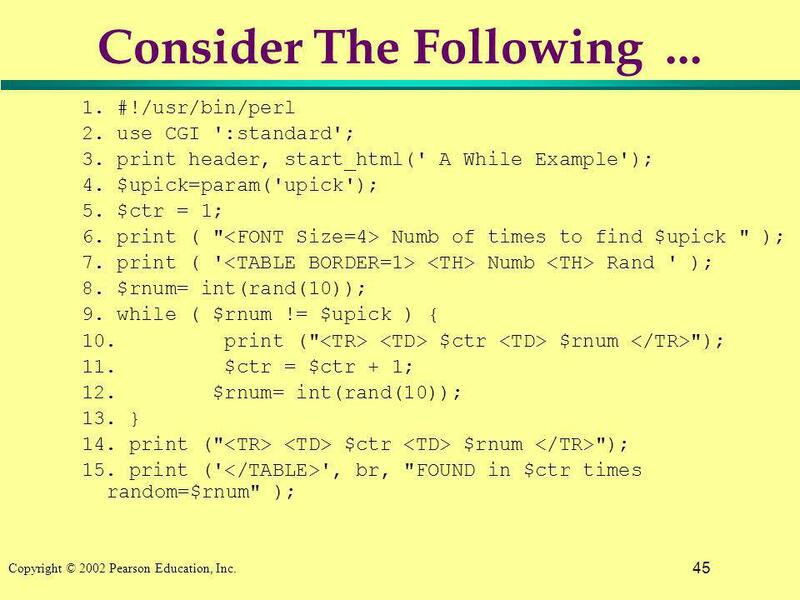 Copyright © 2003 Pearson Education, Inc. Slide 6a-1 The Web Wizards Guide to PHP by David Lash. 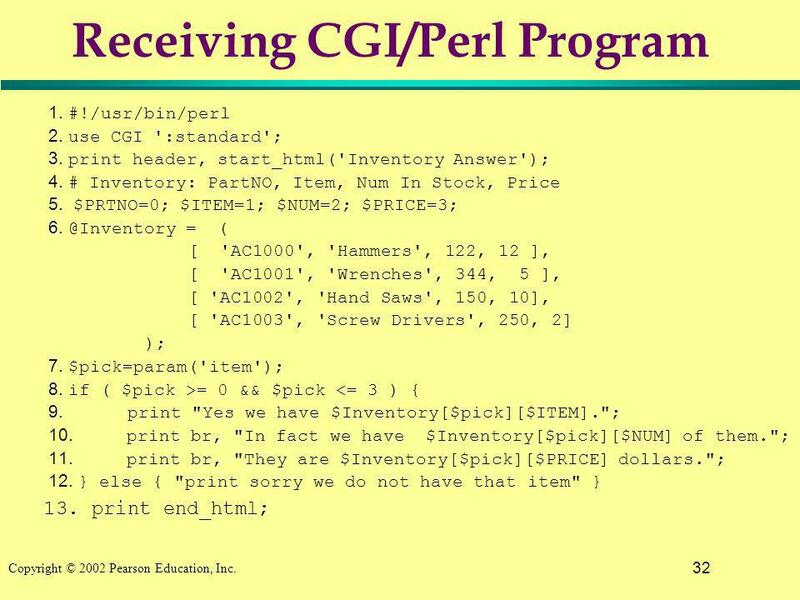 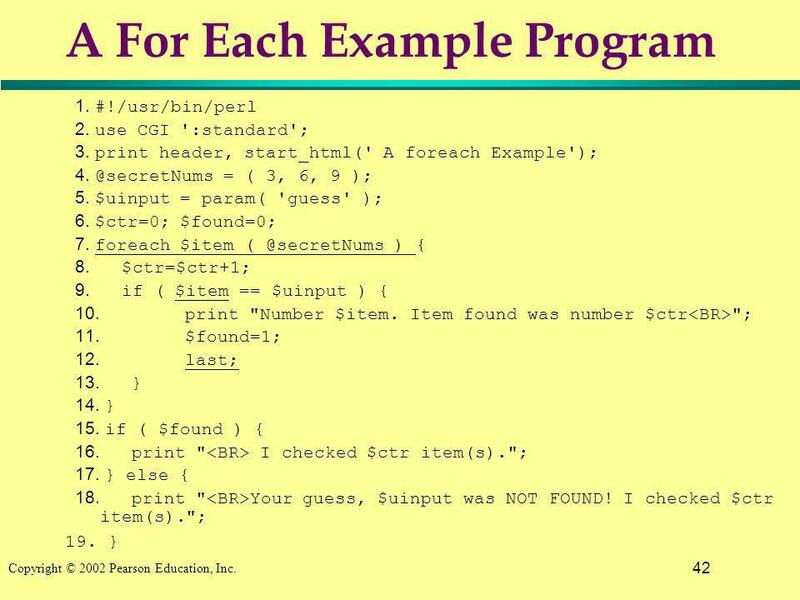 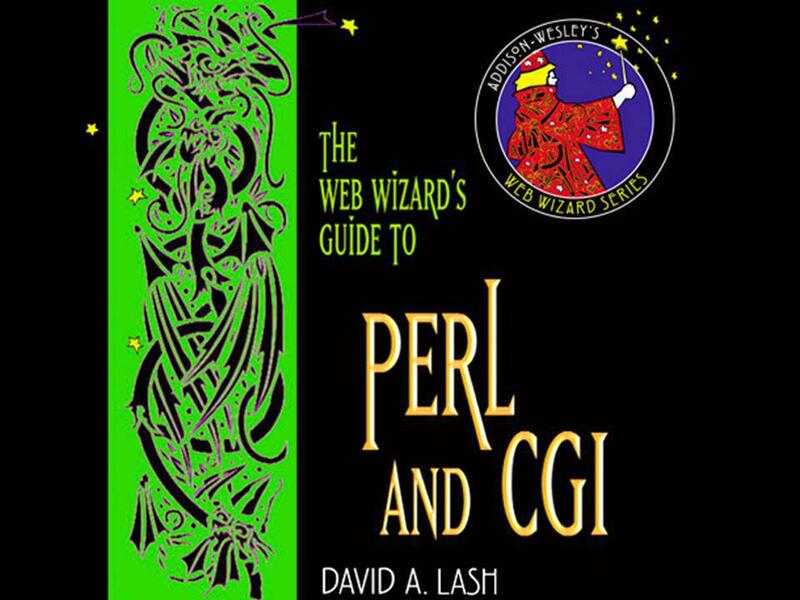 1 Copyright © 2002 Pearson Education, Inc.. 2 Web Wizards Guide to CGI/Perl David Lash Chapter 3 Perl Basics.